At Revolution Indoor Cycling Studio, there are a variety of different classes that you may REGISTER for. The minimum age for all classes is fourteen and the minimum height is 4' 10". Rev Energy (60 minutes) This is a great workout designed for people of all ages and fitness levels. A sixty-minute adventure of leg-pumping, core-stabilizing, heart-pounding, and calorie-burning excitement! You decide the intensity. Rev Strong (60 minutes) A full body indoor cycling workout which incorporates weights (optional) into the sixty-minute class. Designed for fat burning and strength training. Lose yourself in the music, energy, and mind/body experience! Rev Life (60 minutes) WAKE UP! A sixty-minute ride for people who have a busy day ahead. Experience steep climbs, all-out sprints, and long and winding roads. Waken your body! Sharpen your mind and recharge your spirit! Be careful, it's addicting. 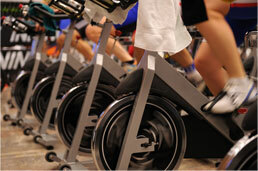 Rev 75 Fit (75 minutes) Your ride begins with a fifty-five minute ultimate, non-impact cycle cardio class. After that, your ride will include the use of light weights. This class will challenge your core and your upper and lower body limits. Light dumbbells, a Spin bike, and great music make it happen! Builds bone density and tones muscle while maintaining flexibility and balance. Stay for the entire class, or leave before the upper body workout. Rev 45 Express (45 minutes) Stay for this forty-five minute class. It's a great lunch-hour or morning class. Rev Spin and Sculpt (60 minutes) The best of both workouts, Spinning and sculpting! Get your cardio and sculpt workout in sixty minutes and be done. This class is great for burning fat and increasing metabolism and muscle definition. Great for all fitness levels! 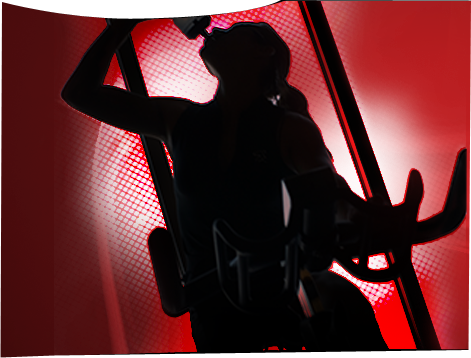 Rev 90 Fit (90 minutes) A high energy, ninety-minute workout to chest thumping music that takes you up and over mountain passes, all while you chase the pack and push your limits! Triple Threat Total Body Workout (Upper Body, Lower Body, Core–Toning-No Bike) (60 minutes) A 60-minute total body workout. Tone your entire body while burning calories and getting strong. Rev Private Call us at (973) 276-0001 about scheduling private solo or group sessions. Rev Party Call us at (973) 276-0001 about hosting your next party.